There are numerous hotels in Rome for you to choose from. If you don’t have any pick-up service from a tour company then you may want to find a hotel that is conveniently located to the attractions you would like to see, for example, there are several hotels near the Pantheon. 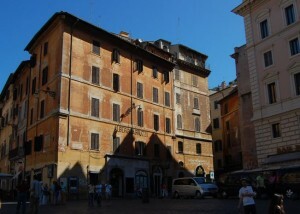 Hotel Sole Al Pantheon – this 4-star hotel is right outside the Pantheon s o location-wise it is unbeatable. Though some people do find it a bit pricey for a 4-star hotel. It’s about USD420 a night, when you can pay about USD390 for a 5-star hotel nearby. Hotel Abruzzi – this 3-star hotel is almost half the price of the Sole Al Pantheon. Again, a hotel right next to the Pantheon at about USD215 per night. Click here to see the detail. The 3-star Albergo Del Senato at about USD280 is another choice. The restaurant at the terrace is a nice place to hangout in the evening. Although it may sound better when the hotels are right in front of the Pantheon, some hotels at the back are just as good or even better. The 5-star hotel Grand Hotel de La Minerve seems to be highly recommended by a lot of travellers. For about USD390 per night, famous tourist attractions like the Trevi Fountain, Spanish Steps and the Vatican are at walking distance and easily accessible. Alternatively, the 3-star Albergo Santa Chiara (at about USD290) and the 1-star Hotel Mimosa are your other choices to be around the Pantheon. Hotel Indigo Rome – St. George is next to the river Fiume Tevere at around USD420/night (5-star). Another one that is close to the river Fiume Tevere is the 4-star Hotel Ponte Sisto which is about USD170/night. pantheon-rome.com is an independent guide website. It is not associated with the management of the Pantheon, the Church nor the tourism authorities of Rome.